The Ghana Private Road Transport Union (GPRTU) and the Ghana Road Transport Coordinating Council (GRTCC), have asked its members and the public to disregard a purported increase in transport fares. A group of drivers calling itself the Committed Drivers Association announced a 20 percent increase in fares yesterday [October, 29, 2018]. This according to the association is due to the increase in the cost of fuel. 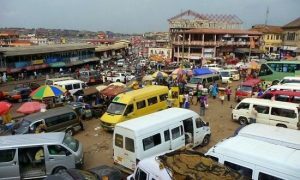 However, the GPRTU and the Ghana Road Transport Coordinating Council, GRTCC, who lead discussions with the Transport Ministry for fare increases, say there is no such increase in fares. Speaking to Citi Business News, an Executive Member of the GPRTU, Edward Hoffman, said there is no justification for an increase in transport fares. He pointed out that there are modalities for calculating and announcing transport fare increases. “One of the major components in increasing transport fares is to check if cumulatively the prices of fuel has increased by 10 percent. Our checks and calculations show that fuel prices have cumulatively increased by just 7 percent”. Mr. Hoffman urged the general public not to accept any increases in transport fares since the GPRTU and the Ministry of Transport are the main stakeholders mandated to announce transport fare increases. Meanwhile, the Ghana Committed Drivers Association has defended its decision to increase transport fares effective Monday, October 29. Chairman of the Association, Charles Danson, insisted the association is an independent body and not bound by decisions of the Ghana Private Road Transport Union nor the Ghana Road Transport Coordinating Council, hence their decision to increase fares due to recent hikes in fuel prices. He explains that the association will go ahead with its planned 20% increase in fares despite calls from the GPRTU not to increase the fares. The post No increases in transport fares – GPRTU clarifies appeared first on Citi Newsroom.